Ray Bradbury came of age in a system that no longer exists, and by virtue of the idiosyncrasies of that system, a tireless work ethic, a long life, and a prodigious imagination, he wound up making an artistic contribution that we will likely never see equaled. None of these things are true anymore, but Bradbury was able to amass a resume of published work, mostly in sci-fi magazines, and forge a novel from many of his related, Martian-themed short stories (The Martian Chronicles) before television had reached its infancy, so when TV arrived and began looking for writers, they found Ray. Still writing prose all the while, he contributed to TV movies, and beginning with It Came from Outer Space, theatrical films. He continued contributing TV scripts for imminently influential shows like The Twilight Zone and Alfred Hitchcock Presents. He wrote every day. And to accomplish that amount of work, let alone that amount of quality work, he certainly had to. His ingenuity, dedication, and ability corresponded with, essentially, the advent of popular culture. Bradbury positioned himself across three (four, if you include radio) media outlets at the time when entertainment began taking shape as a commodity, and kids began stockpiling it in their bedrooms and imaginations. Kurt Vonnegut, Bradbury's contemporary and friend, came from journalism, segued into sci-fi short stories for magazines, and then departed for what I think most people would call "literature." But Bradbury stayed put, always a champion of speculative fiction, and always available to lend advice and/or encouragement to other writers, so his influence achieved an unprecedented breadth and depth. He was a drop of ink in the well of American entertainment, and his contribution is present for everyone who draws water from it today. 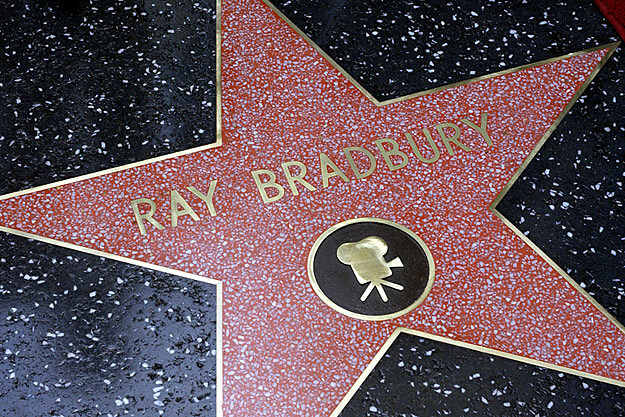 If you've ever watched anything with "Star" in the title or enjoyed a Steven Spielberg movie, you can thank Ray Bradbury. As The G mentioned earlier today, Ray Bradbury's loss has a special significance for those of us in Los Angeles, because Ray was one of us, and an active voice in the writing community here. His 90th birthday party was held at the Mystery and Imagination bookstore in Glendale, and I was very pleased to be able to take my little boy, who was three at the time. He still remembers it, and hopefully will for a very long time. He will not meet the likes of Ray Bradbury again. The world has moved on -- in many ways that Bradbury imagined it would -- and I can say in all seriousness, they just don't make 'em like that anymore. His life represented a happy intersection of a person, time, and place, and we are all the beneficiaries. You'll be missed, Ray. But thank you for everything.